21-year-old defensive midfielder Lorenzo Crisetig is a name that has been on the lips of Italian football pundits for over three years. 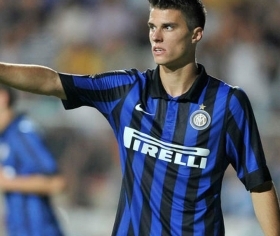 The Italy under-21 international, who currently plays for Inter Milan, has yet to make his debut first team appearance. But there are high hopes for this individual in the future after two successful loan spells at Spezia and Crotone. The 6 foot midfielder had a sterling loan campaign playing for Crotone and his form has been noticed and for his particularly powerful tackling and excellent agility for a holding player. Good in the air and on the ground, international honours surely beckon for this starlet. At the age 14, Crisetig won a youth contract at the Nerazzuri and just a year later he made his first appearance for the Italy under-16 team. Jose Mourinho, the former Inter coach, widely tipped Crisetig for first team action and actually gave him his first team chance in a friendly match in 2009. At the start of the 2014-15 season, it is unsure whether or not Crisetig will be required for the Inter Milan squad. Crotone are trying their hardest to convince the Nerazzurri to extend Cristig's temporary spell at their club, but Inter coach Walter Mazzarri has yet to decide where the youngster will be playing next season. There is certainly a bright future ahead for this youngster - the question will still remain though, is he going to get his big chance at Inter or should he be farmed out on loan again? At 21, he should be playing first team football regularly.